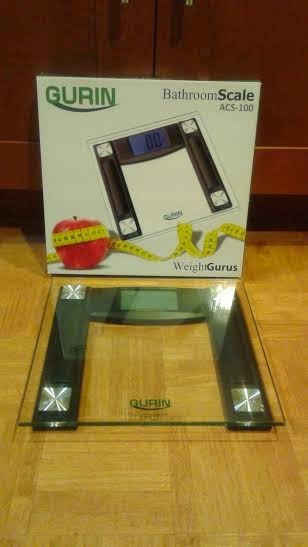 Knowing that I am on my exercise journey and trying to loose the wait, I am so excited about this new Bathroom scale from gurin. This scale is a smart step on technology! No need to tap or switching scale to turn on, all you need is to step on the scale and you get instant reading on it. It has the extra 4.3″ LCD display with the cool blue back light and extra large font numbers. The technology is made from Germany, consistent and accurate measurement up to 400LBs. It automatically turns off to conserve battery life. I love this scale just by the look it’s a unique look and because it’s extra thick and a sturdy tempered glass top. I also love that all I have to do is just step on it and the weight number came on real quick. Nice pretty blue light in the back ground and the numbers are nice and big for me to read. On the back it has the little door for you to put in the battery which this scale runs on 4 triple A batteries, and it has a little switch button to change the unit like “KG”,”LB”, or “ST”. This scale is easy to clean or wipe down at any time. If you have a big bathroom you can leave it a nice corner or if not you can put it in the box and stash it away safely in a closet. Gurin bathroom Scale is easy to use and easy to read. Its also very accurate.